I am very depressed because of what is happening in the Middle East. I had decided to respect my hopes and wait until the end of this inhuman craziness before expressing my feelings and comments. Now, I have to admit that the craziness will probably go on for a long while yet. So, I have decided to take refuge from all these illogical and brutal military actions by hiding and sheltering within my scholarly armour. I shall leave to others, more expert than myself, the condemnations, the scream of supports, the sharp indignations, the terrorist labelling, and the human rights mysterious and magical spells. I am an anthropologist, an academic. My only defence to all this mindless madness is to try to make sense of it; of course, in a flood of useless words, fragile quotations, and gothic cathedral constructions of the intellect, which, however, cannot save even half of one life. So, here my shelter from the bombing of unwished contemporary realities. First, it is important to deconstruct one point. “Israel is not ‘the Jew’”, my very religious Rabbi friend repeated again and again to me. I have no problem to believe him: a state cannot be a person or represent what today is a very heterogenic faith: Judaism. A person is a human being. To be Jewish means to be a person born within (or rarely convert to) a certain religion and holding certain beliefs, or ‘feeling to be’ a Jew (i.e. identity). I have not the space (actually time) to expand further this reductionist discourse, so let me pass to the second logical point. Zionism is not Israel; leave aside ‘the Jew’. An ideology can help to build a state, but a state cannot be an ideology, leave aside the personification of a person, ‘the Jew’. Hence, to really understand what is happening today, not just in the abstract geographical label Middle East, but in the Israeli and Lebanese bombed houses, and in their hospitals and mortuaries, means to stop observing the antithesis (terrorist vs. non-terrorist, axis of evil vs. axis of good, pro-Israeli vs. anti-Israeli and so on) and focus on more complex macrostructures. This often involves suggesting controversial views which need a bit of effort to understand and digest. My intellectual provocation is this one: we are witnessing this carnage because of secularism in action. Asad notices that secularism builds on a particular conception of the world or even “the problems generated by that world”. Let me add to this that this ‘particular conception of the world’, i.e. ideology, frees itself from what I call the phylogeny of ethos (ethos here is seen as values and morals). In other words, secularism, although imposing some values and morals, has deconstructed, by marginalising religion, the course of the development of the particular historical discourse which morality, i.e. ethical values, may have in each society. This is particularly true in the case of Israel because of the conflictual dynamics which took place within the history of Zionism between religious values and political aims. Dynamics which the event of the Holocaust muted by favouring the much needed security and national identity. 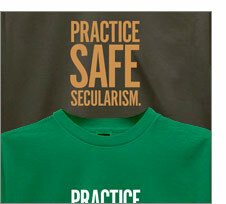 However, it exists also a ‘religious secularism’. For instance, the same dynamics between political needs and national identity can be found in the case of the Iranian revolution (and of course even stronger in the case of Ba’ath parties in the region). For instance, Khomeini and his theories of governance triggered strong theological debate since he had to compromise the Shari’a Law in favour of acts of governance, and in particular he had to sacrifice the ‘phylogeny of ethos’, developing an ethos without phylogenies. The government and the state, including the Ayatollah, who embodied a dichotomising trinity (Spirituality versus State and Government), had to decide between paralysis of power or compromise. As the fratricide Iraq-Iran war had demonstrated, secularised compromises became the preferred options. Some in Israel, as in other Middle East countries, have started intuitively to understand that these ‘phylogenies’ have an important factor: they came from cultural-historical processes of contaminations and exchanges, dialogue, compromises and negations, not only within the same community, but also through the contact with the alien, often the enemy. The ‘phylogeny’ and not just the ‘ethos’, affected by nationalism and religious opportunisms, may be the solution. I’m talking to Hamas representatives every day,” a weary sounding Menachem Froman told me by telephone from the West Bank settlement of Tekoa, where he lives and works as a rabbi. “We have had a lot of meetings and I have just spoken to an aide of my prime minister about this.” But Tel Aviv’s interest in a negotiated end to the standoff is far from assured. The day before the tanks rolled into Gaza, Froman had been due to launch an extraordinary peace initiative at a news conference in Jerusalem with Muhamed Abu Tir, the Hamas MP, Khaled Abu Arafa, the Palestinian minister for Jerusalem, and three Israeli rabbis. The panel was to have made a collective call for the release of Corporal Gilad Shalit, the beginning of a process to release all Palestinian prisoners and the immediate start of negotiations with Hamas on the framework for a peace deal based on 1967 borders. They would also have announced that Jewish and Muslim religious leaders could achieve peace where Israel’s politicians had failed. Now, let me wonder: is there a fear that religion, seen here as the holding of a historical-genesis of the ‘phylogeny of ethos’ could achieve what political (Israeli government) and religious (i.e. Iran, Hezbollah, Hamas, and so on) secularism cannot? What a challenge, for this millennium, if people who strongly believe will resolve the Middle East crisis!